Pop a cold one, because today is the 80th anniversary of the beer can. On this day in 1935, Krueger’s Finest Beer and Krueger’s Cream Ale landed on store shelves. We’ve come a long way since those meager offerings of the '30s. Today, there are more than 2,000 different canned beers out there. To celebrate the birthday of the humble beer can, we give you, in no particular order, 80 beers for 80 years. They come from all ove the country, from big breweries and tiny ones. And there's 80 of them, so there is almost certainly something for every single beer drinker out there. So go pick up one of these today and raise a toast to that wonderful aluminum cylinder. 1. Oskar Blues Dale’s Pale Ale: Dale’s is the canned beer that started it all. It’s a well-balanced, hop-forward pale ale with floral, piney notes fit for the woods. 2. Bell’s Winter White Ale: Not all winter beers have to wallop you over the head with alcohol and spices. In fact, Bell’s Winter White Ale doesn’t use any spices at all. 3. Avery IPA: A great balanced IPA out of Boulder, Colorado. 4. Anderson Valley The Kimmie, The Yink & The Holy Gose: Tart and salty but easy to session at only 4.2 percent ABV. 5. Deschutes Mirror Pond Pale Ale: The Bend, Oregon, brewery makes a lot of great beers but just started canning this one in 2013. 6. Anderson Valley Winter Solstice Seasonal Ale: If you like your winter warmers a bit more restrained in alcohol but still big in taste, Anderson Valley’s Winter Solstice will be right up your alley. 7. Fremont Harvest Ale: A fantastic fresh hop pale ale. 8. Half Acre Daisy Cutter Pale Ale: This Chicago local is lighter-bodied and boasts strong citrus. 9. 21st Amendment Hell or High Watermelon Wheat: It’s a picnic in a can. 10. Big Sky Trout Slayer: Craving a wheat beer without the fruit? Big Sky’s Trout Slayer is as pure as it gets: unfiltered, crisp and sessionable. 11. Sixpoint Resin: New Englanders, rejoice! This massive hop bomb weighs in at 9 percent ABV and more than 100 IBUs, and its name tips the hand of its dominant characteristic: sticky, resiny hops. 12. Ballast Point Sculpin: Until recently, this stellar IPA was a hoppy gem available only in 22-ounce bombers with limited distribution. Thanks to a big ramp-up in production, you can now find it all over both coasts and in travel-friendly cans. 13. Surly Coffee Bender: Coffee Bender is an American brown ale that drinks like a porter. 14. Maui CoCoNut Porter: Specialty malts play nicely with a touch of sweetness from toasted coconuts. 15. Anderson Valley Barney Flats Oatmeal Stout: A backcountry beer for backcountry camping. Dark and roasty, this beer will complement any food cooked over an open flame. 16. Sierra Nevada Torpedo Extra IPA: Did you know the Torpedo is the best-selling IPA in the country? Now you do. 17. Rhinegeist Truth IPA: A potently hopped, fruity IPA from Cincinnati. 18. Bell’s Oberon Ale: It’s a shame this excellent wheat is only available in the spring and summer. 19. Golden Road Wolf Among Weeds: A strong IPA from one of L.A.’s first craft breweries. 20. The Alchemist Heady Topper: Distribution for cans of the cultishly popular IPA is not wide. It only goes out within a 30-mile radius of the Vermont brewery. 21. Carolina Kolsch: There is very little bitterness to speak of here; instead, it has a pleasant light fruitiness to accent the sweetness of the malts. 22. Rogue American Amber Ale: The only can put out by the excellent Oregon brewery. 23. Firestone Walker 805 Blonde Ale: A nice sessionable blonde from Paso Robles, California. 24. Cigar City Jai Alai IPA: A fruity IPA named for the fastest game in the world. 25. Hilliards The 12th Can: With the Super Bowl coming up, how can you not include a pale ale named after the Seahawks fans? 26. Founders All Day IPA: One of the best session IPAs out there. 27. Tröegs Troegenator Double Bock: A big malt bomb that regularly cleans up at the Great American Beer Festival. 28. Austin Beerworks Peacemaker: They were actually selling this pale ale in 99-packs. 29. Schlafly Sessions American Brown Ale: An easy-drinking brown out of St. Louis. 30. Boston Beer Company Cold Snap: A spicy winter seasonal from the folks at Sam Adams. 31. Brooklyn Lager: The beer that put this New York City brewery on the map. 32. 21st Amendment Fireside Chat Winter Spiced Ale: This warming strong ale is brewed slightly differently each year. The most recent layers spices and a light touch of cocoa nibs atop a malt base brimming with graham cracker flavors. 33. Nebraska IPA: A hoppy entrant from a state that is still relatively new to the craft-brewing world. 34. 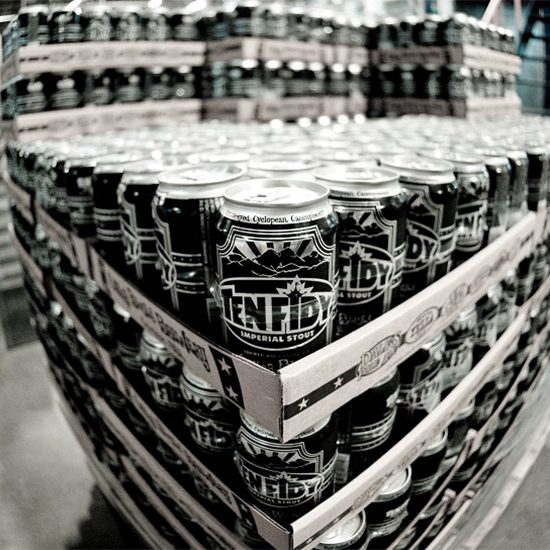 Oskar Blues Ten FIDY: Ten FIDY is only available for half of the year. But at 10.5 percent alcohol, it’s probably best that the brewery restricts our access. 35. Terrapin Recreation Ale: A hoppy session beer they hope you’ll take hiking with you. 36. Bronx Pale Ale: A nice, straightforward pale you can drink a few of. 37. Heavy Seas Loose Cannon: A big, pirate-themed IPA. 38. Sea Dog Blueberry Wheat: If you like fruit in your beer, this could be the one for you. It overflows with blueberry flavor. 39. La Cumbre Elevated IPA: A big hop bomb from Albuquerque’s up-and-coming beer scene. 40. Evil Twin Hipster Ale: One of the easiest-drinking Evil Twin beers. Perfect for consuming ironically. 41. Hopworks Abominable Winter Ale: IPA is nowhere on the label, but you should prepare your taste buds for the hoppiest winter ale you’ve ever encountered. 42. Cisco Whale’s Tale Pale Ale: A smooth pale if you want something not too hoppy. 43. Brewery Vivant Ski Patrol: A nice, spicy winter wheat. 44. New Belgium Fat Tire: The amber ale that has become synonymous with one of America’s best-known craft breweries. 45. Upslope Christmas Ale: Using Abbey Ale yeast and plenty of holiday spices, this sweet, fruity ale from Colorado’s Upslope Brewing Company basically begs to be stuffed in a stocking.46. Oskar Blues Mama’s Little Yella Pils: Yet another from America’s canning kings. This should be on any list of great pilsners. 47. Anchor California Lager: The first can from America’s first craft brewery. 48. Bauhaus Stargrazer: A schwarzbier (black lager) from a Minneapolis brewery whose cans are fashioned after the modernist German school. 49. Westbrook White Thai: A wit with South Asian flavors. Think fresh lemongrass. 50. 4 Hands Contact High: A cross between a pale ale and a wheat from the up-and-coming St. Louis brewery. 51. 10 Barrel Pub Beer: Some controversy remains after Anheuser bought the Bend, Oregon, brewery. But it’s still making great beer. 52. Uinta Hop Nosh IPA: Somehow, Unita manages to make a great IPA in Utah, a state with some of the most restrictive beer laws in the country. 53. Angry Minnow River Pig Pale Ale: A balanced pale ale with just enough piney hops from a tiny Wisconsin town most famous for hosting the largest cross-country ski race in North America. 54. Denver Beer Co. Graham Cracker Porter: There aren’t tons of canned porters out there, but this one out of Denver is a good one with notes of vanilla and spice. 55. Evil Twin Bikini Beer: Evil Twin's ultimate session IPA comes in at only 2.7 percent ABV. 56. Two Roads Road 2 Ruin: Aggressive hopping makes this boozy double IPA stand out. 57. Surly Overrated West Coast IPA: A hoppy ale that Surly brewed to shut down haters who thought they only brewed gimmicky beers. 58. Karbach Rodeo Clown Double IPA: Everything is bigger in Texas, including this imperial IPA. 60. Santa Fe Brewing Company Imperial Java Stout: The chocolatey stout uses beans roasted by local coffee house Ohori's. 61. Orpheus, Brewing Atalanta: Just a nice, easy-drinking tart farmhouse ale. 62. Sierra Nevada Pale Ale: The well-balanced flagship beer from the just recently bicoastal brewery. 63. Otter Creek Overgrown: A slightly sweet and powerfully hoppy pale ale from Vermont. 64. Sixpoint Sensi Harvest: Keep an eye out for this wet hop beer in the fall. It’s never around for very long. 65. Stillwater Artisanal Ales Classique: Stillwater is masterful with many saisons, and fortunately they decided to can this one. 66. Bell’s Two Hearted Ale: The flagship brew from Bell’s is one of the best pale ales in the country. 67. Mikkeller Better Half: A light IPA from the Danish brewmaster. 68. 21st Amendment He Said Baltic Porter: A sweet, malty explosion. 69. Founders Centennial IPA: If you want to step it up from the All Day IPA, Founders has got this one for you. 70. Two Beers Day Hike: A light but flavorful and balanced session ale from Seattle. 71. DC Brau The Corruption: A maltier-than-normal IPA out of the nation’s capital. 72. SanTan Hefeweizen: Full of the banana-y characteristics hef drinkers know and love. 73. 18th Street Brewery Sinister: A sticky, hoppy imperial IPA from Gary, Indiana. 74. 450 North Brewing Barn Yeti: A sweet, sweet chocolatey Belgian-style dark ale. 75. Spiteful IPA: An appropriate name, considering the intense hoppy bitterness. 76. Ska Brewing Modus Hoperandi: A solid, bitter IPA out of Durango, Colorado. 77. DryHop, whatever’s on tap: The Chicago brewery specializes in hoppy ales, and they’ll can one for you right in the taproom with their crowler machine. 78. Cigar City Hopped on the High Seas: Each batch of this IPA is brewed with a different single hop variety, making each one unique. 79. Blue Dog Mead Yellow Collar: They are totally canning mead now. And Blue Dog out of Eugene, Oregon, puts out some great versions of the sweet and boozy honey drink. 80. PBR: Because you know what, if you made it through the other 79, you need something you can just pee out.